More limited edition collector fragrance bottles, with the usual disclaimers: in most of these cases, the juice is unchanged, just the bottle is “special” (or not, as the case may be), and some of these may not be available in the US. Today's post includes summer limited editions from Issey Miyake and Jean Paul Gaultier, a new collector bottle from By Kilian, and a new Eau de Toilette concentration of Stella by Stella McCartney. 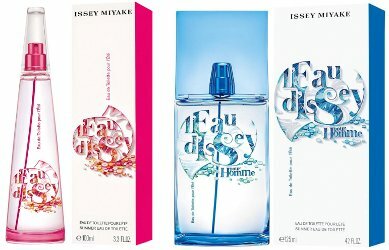 From Issey Miyake, the summer editions of L'Eau d'Issey (100 ml) and L'Eau d'Issey Pour Homme (125 ml) for 2015. This year's series feature designs by artist Yulia Brodskaya. From Jean Paul Gaultier, the annual summer editions of Classique and Le Male. 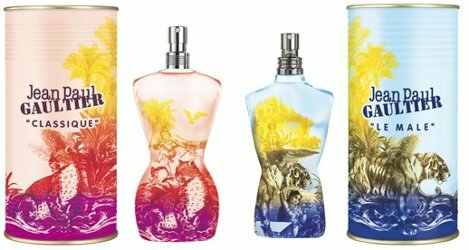 This year's theme is Indian Summer, and the bottles feature a panther (Classique; 100 ml) and a tiger (Le Male; 125 ml). 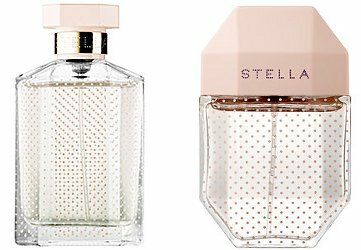 From Stella McCartney, a new Eau de Toilette concentration of Stella: "The new STELLA Eau de Toilette is inspired by the idea of a fresh, dewy rose captured in the morning sun. Underscored by sparkling green notes, this bright and bold composition embodies a young, fresh fragrance. The unique scent opens with top notes of fresh mandarin and frozen lemon, balanced with watery tones of freesia to create a soft, dewy feeling. An infusion of Bulgarian rose essence, crunchy violet leaves, and delicate peony petals brings a freshness to the feminine floral heart, while amber gris base notes reveal a subtle masculine undertone." At Sephora, in 30 (above right), 50 or 100 ml (above left). The JPG ones are nice, as they always are when it comes to the summer limited editions. The Issey ones are also quite cute. I like all of those too, and really like what they did with Stella EdT. Looking forward to trying the Stella, though none has won me over in the past. And though I usually prefer the standard striped blue Le Male bottle, I have to say, the kitty-cat one is nice! I like Stella but never cared much about the summer Stella Sheers…assume this will replace that. No lemmings. The cats are ok on the JPG bottles. I just really don’t like those bottle shapes. I like Stella some but it’s definitely not my favorite rose. I would be interested to smell “frozen lemon” but it’s probably just marketing faff.